Edit: Due to the fact that this article is old, the installation instructions may not work anymore. In order to successfully install the latest version of UberWriter, please access the uberwriter tag and open the latest article (the one on top). Hello Linux Geeksters. As you may know, UberWriter is an open-source writing application, with markdown support and features for exporting files to PDF, RTF, ODT and HTML, via pandoc. The software allows the users to write in either fullscreen or the focus mode, that highlights the sentence which is currently written. The default skin provides a white background, some horizontal lines and a dark font, but the users can choose an inverted skin, having a dark background and white font. For a demonstration of the UberWriter features, see the below video. The latest version available is UberWriter 12.07.9, which is available only for Ubuntu 13.10, either the deb package and the sources being unusable on newer Ubuntu systems, by default. 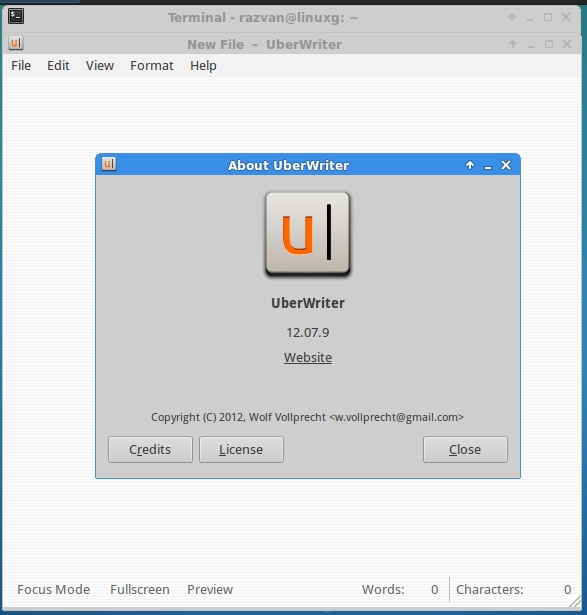 However, a third party user has ported UberWriter 12.07.9 for Ubuntu 14.04 and derivatives. In this article I will show you how to install UberWriter 12.07.9 on Ubuntu 14.04 Trusty Tahr, Linux Mint 17 Qiana, Pinguy OS 14.04, Elementary OS 0.3 Freya, Peppermint Five, Deepin 2014, LXLE 14.04, Linux Lite 2.0 and other Ubuntu 14.04 derivative system.